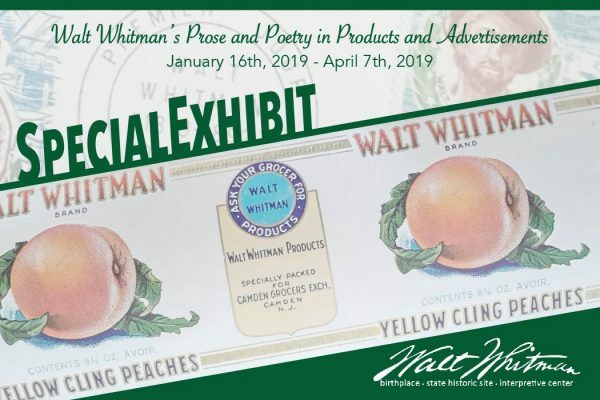 To coincide with our year long commitment to Walt Whitman’s 200th Bicentennial celebration, we are collaborating with Ed S. Centeno, Walt Whitman Collector, in exhibiting various cultural artifacts depicting segments of Whitman’s prose and poetry in advertisements, posters, commercial products, fine arts, and private art commissions. Centeno has spent the past 33 years collecting Walt Whitman artifacts and memorabilia. Centeno’s collection features the commercialization of Whitman’s name, image, and body of works. The significance of Whitman’s literary contribution clearly resonates into modern society. This collection enriches the knowledge of the past, preserves and promotes the importance of collecting for future generations, and acquaints others with the phenomenon of Whitman’s popularity.